The Amelia Canvas Blouse is a staple addition to any historically inspired wardrobe. Made of cotton canvas, this womens blouse features an adjustable drawstring neck, long sleeves, and a lightly shaped, figure flattering construction. Great for peasants, maidens, and more, this versatile womens reenactment shirt can be worn with the neck loose for a shoulder baring look or tied tight to create a more demure presentation. The cord of the drawstring neck is tied in the back. This long sleeve medieval blouse is easy to wear, as its gently shaped style offers the subtle impression of a curved figure without a tight fit. 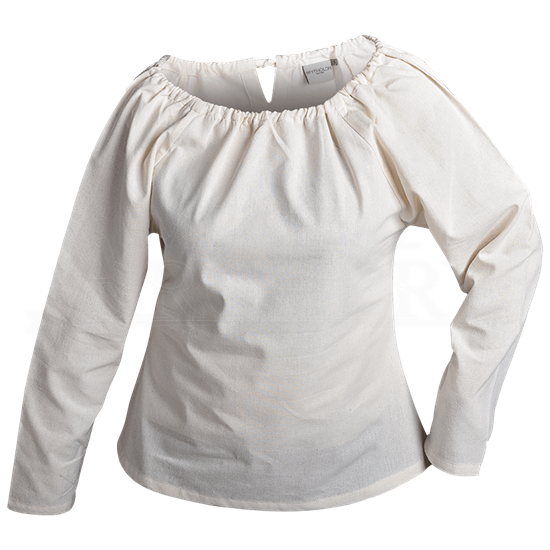 Wear the Amelia Canvas Blouse with your favorite skirt and bodice, and easily transform yourself into a maiden straight out of history or high fantasy at your next historical reenactment, LARP activity, or other costume-worthy event.